Nate Teachers Desks are in a class of their own. With sturdy construction, user-friendly features and a choice of innovative styles, the Nate is ready to take on the rigors of any modern classroom. 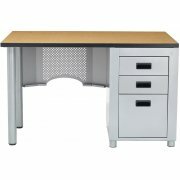 High-pressure laminate desktops resist stains and scratches while 16-gauge steel legs provide sturdy support. 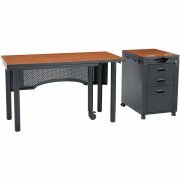 These teacher desks include box and file pedestals so educators have plenty of room to store pencils, glue and markers as well as lesson plans, student files and unmarked papers. 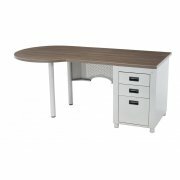 Ball bearing file drawers will stand up to repeated opening and closing as papers are retrieved throughout the day. 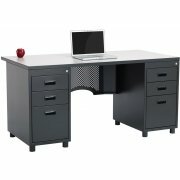 A stylish and functional teachers desk can help any educator maximize productivity and organization during school hours. 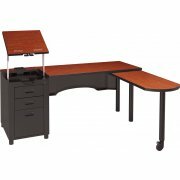 Make sure to check out some great options including a built-in adjustable-height podium, mobile pedestal and retractable return. 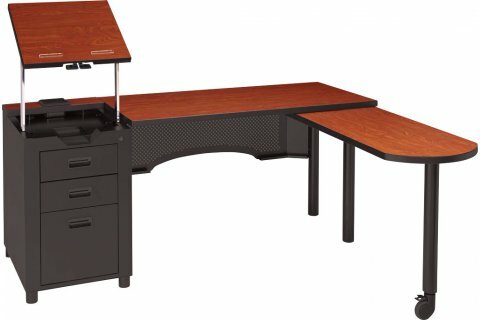 When it comes to teacher desks, the Nate gets an A+. Smooth Worksurface: The desktop is made of 1.125" fiberboard with a high-pressure laminate surface and 2mm edge banding. 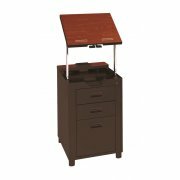 Easy Sliding: Ball bearing file drawers are a great place for papers, tests and other documents. Incredible Options: Adjustable-height podium, removable pedestal and retractable return available on select models.